Naughty Dog has revealed everything you could possibly want to know about the Uncharted 3 multiplayer beta. The multiplayer mode added to Uncharted 2 was a unique, deep, and fun take on both co-op and competitive online play. For Uncharted 3, Naughty Dog is beefing up multiplayer so much it'll barely be recognizable. Players will get a first taste when the Uncharted 3 multiplayer beta begins on June 28 for PlayStation Plus subscribers and InFamous 2 buyers that received a code, while all PSN users will gain access on July 5. The beta will end on July 13. Naughty Dog will be showing off nine multiplayer modes in the beta, including team deathmatch, 3-team deathmatch (2v2v2), team objective (complete goals), free for all, plunder (capture the flag), high stakes (players wager experience points and cash), and three co-op modes that are still under wraps. In addition, players will get to experience Uncharted 3 multiplayer's power plays, new boosters, medal kickbacks, gun mods, avatar customization, dynamic level content, and the treasure set collection system. Quite a lot. Power plays are one-minute events that trigger during play. A certain opponent may be marked whose death or safety awards a special bonus. Another power play turns all opposing team members into skeletons and turns on friendly fire with a penalty for killing one of your own. They're sure to spice up every match. Players level up both their profile and Boosters (equippable abilities) in Uncharted 3 multiplayer, with the beta featuring 8 Boosters. Naughty Dog has revealed that "pricey-but-potent" paid Boosters will also appear as players rise in rank. Evening the odds even further are gun mods that can increase gun efficiency with improvements in ammo capacity and rate of fire, and Medal Kickbacks. Medal Kickbacks are earned when a certain number of medals, say for headshots or multi-kills, are earned, giving players an instant rocket launcher or the ability to vanish in a puff of smoke. Even further, fallen enemies will "occasionally" drop pieces of a randomized treasure set that once fully collected will award an item, gun, emblem, etc. Cosmetically, Naughty Dog says there are "hundreds and hundreds of parts" with customizable colors used to alter your character's look. Uncharted 2 featured a wide variety of characters to play as, but Uncharted 3 will make each character unique through these parts. 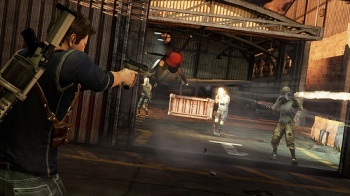 Dynamic level events, such as a fire slowly consuming a Chateau to reveal new weapons and accessible areas, will also be a part of Uncharted 3's multiplayer mayhem. Check out the first Uncharted 3 multiplayer trailer here to see it in action. Could you really ask for much more?